Camping in the Costa Verde region with Lux Camp! 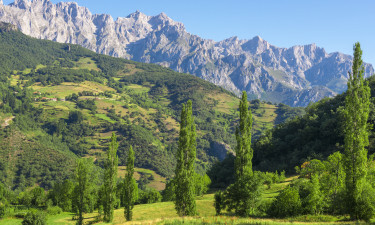 The Costa Verde / Cantabria region is a beautiful area that combines idyllic rural landscapes, a dramatic coastline, and some of the most impressive mountain scenery in Southern Europe. Add a fantastic gastronomic tradition and a wide range of outdoor activities and you have the perfect recipe for a luxury camping trip. Get in touch with LUX-camp to find out more about camping in this region or to book your next rural getaway in northern Spain. 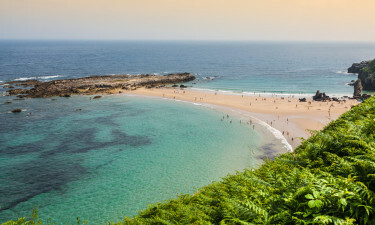 The stunning Costa Verde / Cantabria region is one of Spain's best kept secrets. 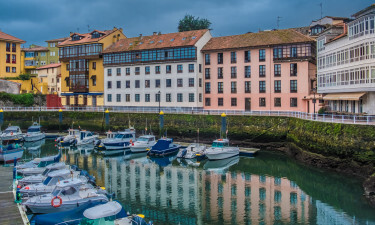 Whereas many holidaymakers head towards the busy resort towns of the Mediterranean, savvy travellers in search of peace and quiet know that Cantabria is a hidden gem. 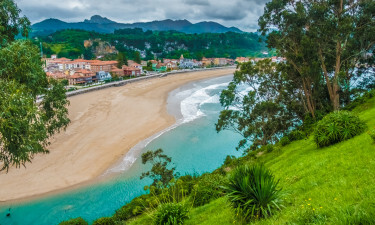 The Costa Verde stretches for 250 miles along the northern coast of Spain, running the whole length of the rural regions of Cantabria and Asturias. Thanks to its low-key atmosphere and varied scenery, Costa Verde / Cantabria is the ideal choice for a relaxing camping holiday. Why should I camp in Costa Verde / Cantabria? Costa Verde / Cantabria is mostly undeveloped: you will never be too far from remote mountain areas and from unspoilt beaches. This area is considered the outdoor capital of Spain – there's no better destination if you love being outdoors and enjoy fresh air and exercise. Dozens of modern and luxurious campsites to choose from. A rich cultural heritage that is reflected in the distinctive local gastronomy. Santander is the region's largest city and one of Spain's most underrated destinations. Take your time to explore its medieval palaces, elegant buildings, and award-winning restaurants, many of which overlook the spectacular El Sardinero Beach. Looking for the ultimate relaxation experience? Then why not visit Costa Verde's spa towns, like Puente Viesgo, Solares, or La Hermida? 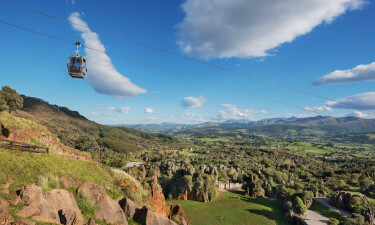 For a bird's eye view of the region, get on the Fuente De cable car, or hike along the breathtaking Rio Carranza Gorge. Other must-sees include the Cabarceno zoo, the Altamira caves, and the pretty towns of Castro Urdiales, Potes, and Torrelavega. Good food and better wines are everywhere in Costa Verde. The local gastronomy features excellent fish and seafood dishes, cold meats, and hearty stews that can be paired with the red or white wine of your choice, as local grape varieties include Gewürtztraminer, Chardonnay, Syrah, Riesling, and Tempranillo. Average temperatures in Costa Verde are slightly lower than in the rest of Spain, staying around 17°C between April and October and making this area ideal for a blissful day on the beach of for a hike in the mountains. Be aware that rainfall can occur anytime -after all, the Costa Verde would not have its trademark lush vegetation if it wasn't for the rain!